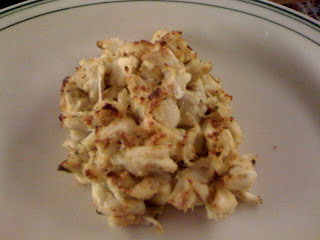 Close up of the 5oz crabcake - look at those lumps!!!! Friendly Farm is a family-style restaurant located about 30 mins north of Baltimore and set on a farm estate. The restaurant itself is in a white Farmhouse, that is very pretty from the outside which slightly makes up for the bare-bones inside decorations. Get a table by the large windows so that you can look out at the fields and ponds and forget that you're seated in an almost cafeteria-like dining area. If you go in better weather, it's nice to take a walk to the pond and feed the geese and ducks - children are usually always playing around there. When you walk in to the restaurant, you immediately order your main meal. The price may seem high - but you are actually getting much more for this price, which I go over next. So first choose your entree from a menu that includes Fried Shrimp ($20.95), Fried Chicken ($15.95), or Seafood Combo - one 5oz crab cake and 1/2 dozen fried shrimp ($26.95). I usually always order one 5oz broiled crab cake for $19.95. The crab cakes here are just superb, in fact, it won the honor of being named one of Maryland's best crab cake by Baltimore Magazine. There are huge jumbo lumps and not a lot of filler, the seasoning is great too. Definitely one of my personal favorites. The fried chicken here is also very good, and a great alternative if you're not into seafood. So what else do you get for that all-inclusive price? Once you get seated you get served your "appetizers" of small refillable plates - cottage cheese, pickle spears, celery sticks, rolls and sugar rolls (outstanding donut-like rolls), apple butter (for the sugar rolls mmmmmmmmm), coleslaw (quite yummy), beets and some kind of fruit. Be warned though, the fruit are canned fruit, not fresh. Also, please tell your server whether you don't want any of these sides so they don't bring them out automatically. Alongside your main meal comes green beans, corn (both of these are the canned varieties as well) and fries. If you go in a group, ask for a refill of the fries as soon as they bring you the first bowl....you're going to want one. After your meal, you can order sherbet or ice cream. I usually stick with the moose tracks ice cream- vanilla with chocolate chunks and mini peanut butter cups (which I scoop out and give to Dan). On top of all that, you can order soda, coffee and apple juice or V8 to start your meal. So there you go. That's a LOT of food for that price, as you can see. Personally, I am not a fan of anything canned, except the corn, so unfortunately this ends up being an unhealthy meal for me - but some days I suppose you need a dinner consisting of sugar rolls, crab cakes, fries and ice cream, right???? Overall, though Friendly Farm is lacking a bit of atmosphere inside the restaurant - the setting is quite lovely and the food is good. Go here if you love crab cakes, enjoy family style dining and like driving through country roads! I live right up the street from Friendly Farms. We can smell the chicken in the air on some days-lol. They absolutely have the best crabcake. We order carry-out a lot. Most people don't know they offer it. The prices are cheaper because everything is a la carte. The grilled pork chops and cottage cheese are fantastic. You're right - great for a country drive. Everything you said is so true. I find myself eating and enjoying things when I am there that I would never eat otherwise. I rediscovered that I like beets and for the first time came to appreciate cottage cheese; the canned vegetables are not anything like fresh, but somehow are exceptable here. Who knows why? Maybe it is the view from the windows. The fried shrimp are very good and the fried chicken is pretty fantastic also. The chicken needs a bit more salt but that can be taken care of at the table because it comes out still hot from the fryer. thanks for the recommendation. I have been searching a family restaurant for the whole family because we will have a meeting next week. Need a Little Food Help in this Blizzard? Had too many snowed-in cookies?